Mahindra Thar was first seen in the year 2010 at Indian Auto Expo. It is company’s first car to have a type of oil-burner engine (steam engine). This car has a retro, bold and muscular look which is maintained all throughout the variants. The bold and muscular look of the car is due to the alloy wheels and broad tyres. The inside of the car is simple with minimum design. The technology used for the car helps in optimum control over the throttle response. The size of the wheels is big enough to offer optimum control which replaces the need of power-steering. This wheel size with the ground clearance enhances the off-road capabilities making it sustainable in the market. The recent model of the car has capacity to occupy 7 passengers. There are 3 variants of this car with 2 engine, 1 transmission and 1 fuel option. Mahindra Thar DI 2WD – Diesel variant with 13 kmpl mileage, manual transmission and ex-showroom price around INR 5,04,000. 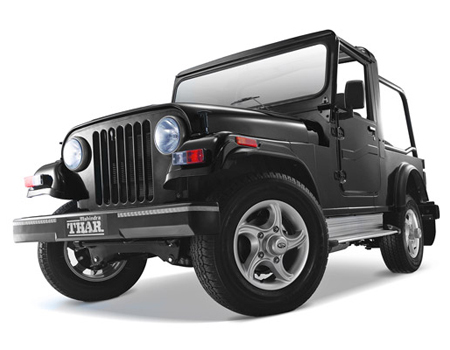 Mahindra Thar DI 4WD – Diesel variant with 13 kmpl mileage, manual transmission and ex-showroom price around INR 5,53,000. Mahindra Thar CRDe 4x4 AC – Diesel variant with 13 kmpl mileage, manual transmission and ex-showroom price around INR 7,69,000.